LA Sparks on that Title Run! Hello Sparks fans! We are finally Baaaallllliiiinnnn! The LA Sparks are on a winning streak(6)after defeating the Chicago Sky. I tell you what, this win streak could not have come at a better time, after this win the Sparks now sit in 3rd place in the west 2 games behind Seattle. What has caused this "dramatic" change for the Sparks you may ask, the team is healthy. Finally the entire team is ready to go. Well almost the entire team, Vanessa Hayden-Johnson sprained her ankle in the last game. 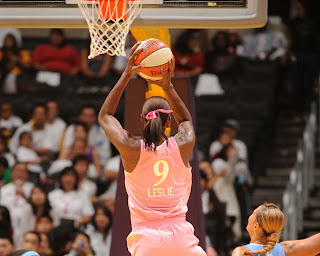 Lisa Leslie has come back from a knee injury averaging 18pts/10rbs, and the reigning MVP is playing like it again. It only took this SUPERSTAR 2mos to be back at MVP form. In spite of not playing in the first 8 games of the season, Candace Parker now lead the league in double doubles with 9! 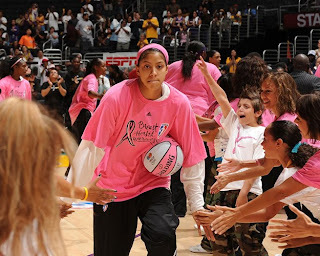 Yes, Ms you know my name, and you know my worth...I'm the face of the League..I am Candace Parker! And what else can you say about Lisa Leslie? She has now scored over 6000pts...and since the injury to her knee, she has come out on fire. She is now playing like this is her final season and she wants to make sure it does not end prematurely! Last season Lisa and Candace came up 1.3 seconds short of reaching their destination, and they had far less talent then they have now. With Tina Thompson and Betty Lennox, along with Noelle Quinn(who has turned out to be a baller)the Sparks have the perfect set of "role" players to go all the way. So Seattle Storm here we come! I suggest you get out of that #2 spot, and drop to fourth, because you don't want to see us in the first round, and watch a repeat of last season. Even with Lauren Jackson in the line up this time, we won't be denied. Lauren Jackson and Lisa Leslie's rivalry goes back a long way, and unfortunately for her, she came when Lisa was just getting started. The olympics, and the WNBA, wherever Lisa is, Lauren has NO win. This is going to be a great story for Lisa to tell Lauren about how her team started the season horribly, but turned it around at the right time and she won her 3rd WNBA title before she retired. Be sure to check out the Song "Here Dey Come (Sparks Baby)...written by Mr.Floz you can hit him up on twitter.com/MrFloz let him know what you think about it.